The calm water of the pond lapped gently against the shore, tossing drops of water onto the pebbles. Oscar, the otter, lay curled on a flat stone, enjoying the warmth of the sun. His brown, furry coat, dry and satiny, poked up in places. “Look at that otter, Mama. It's pokey,” said one of the baby birds. A mother and her five babies stood on a branch that hung over the pond. “He looks funny, Mama. He's all shiny and brown,” said another bird. “Otters eat some of the plants in the pond. If they didn't, then soon there would just be plants and no water for you to fish in. Otters eat some of the fish too,” Mama said. Oscar yawned and sat up. He saw the birds watching him. “Hi, Oscar. 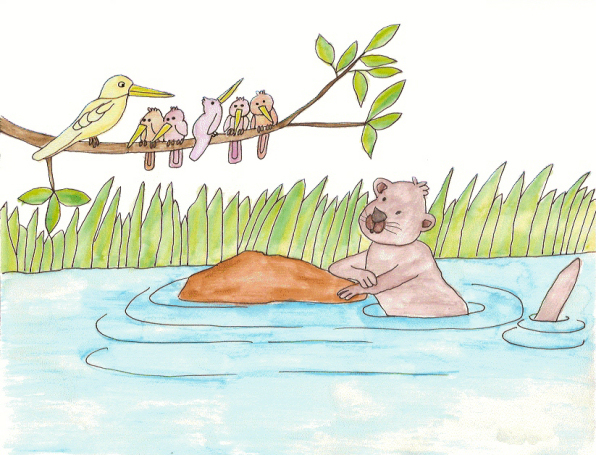 Mama says you do useful things in the pond,” the baby bird said. Oscar slipped off the rock into the water and swam to another rock right under the birds. “Well I think your hair pokes up and looks messy.” All the birds laughed. Oscar reached up and held onto the branch. He pulled it down. The birds had to hold on with their claws. When it just about touched the water, he let it go. All the baby birds and their mama went flying through the air and landed in the pond. When they climbed out on the shore, their feathers stuck up all over. Oscar and the birds spent the rest of the day diving for fish and trying to catch mosquitoes. Every day they came back to the branch and played with him. Whenever Oscar saw their mama, he winked at her and she winked back.